I apologize for not getting a post out sooner. But, I have to admit, I was having a difficult time looking at my photos after the removal. After spending the entire summer with these horses and then being there for the removal of the mountain top horses, I had a lot of emotions that weren’t ready to surface. 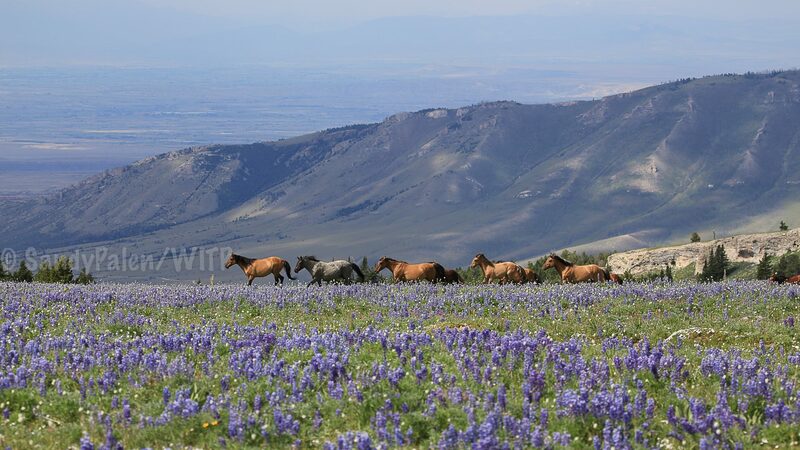 All of the horses removed, I had seen as little foals, watched some of them leave their family bands and become bachelors, and watched others get to know their home on the mountain. I knew I had hundreds of photos of the horses that were removed, and I just was not ready to see them. It was this week, that I realized I was ready, and actually looking forward to reviewing the thousands of photos from the summer. I have been very blessed to have been able to spend so much time on the mountain with these horses. This first post is only of my very first trip up there. After several months away from the horses, I find that my first trip, I take a lot of photos, then with each following trip, I begin to take less shots, and put down my camera to watch the horses and my guests through my own eyes. June is one of my favorite months on the mountain top. The mountain is just awaking after a long winter, and the horses are much more active with each other. The mountain top brings them all in closer proximity to each other then what they are in the winter months, so there is more action between the stallions on a regular basis. If you don’t mind the cool nights and want a lot of action shots, this is the month for you. I’m not sure how much longer I will be be doing guided tours, so I cherish each moment I had there with my guests and the horses. I will be doing two guided camping trips in June this year. They are starting to book, so if you are interested, contact me soon. Go to 2016 Camping, to find out more information, with available dates for June, July and August. So, below are some of the photos I took during this first trip. Bolder’s band visited our camp on a regular basis, with Killian and Lobo denting my truck during a sparing match. I’ll be publishing “Part Two of Summer 2015” soon! So many beautiful photos! I always love seeing your pictures! Thank you so much Kate!! horse dents…cool! haha or not! Is Noble missing the tips of her ears? Or is it just the way they’re turned? London has turned into quite the hunk of a horse. Noble lost the tips of here ears do to frostbite when she was younger. Thanks Emma! I wish you could too! 🙂 Loved getting to know you! Beautiful post Sandy! I love all the pictures and I’m glad they have turned into a source of happiness and comfort instead of sadness. I absolutely LOVED my time on the mountain with you, I consider myself very blessed to have had the opportunity to spend part of the summer with you and the horses. I will certainly cherish my memories and pictures forever!! Beautiful photos, Sandy!! Some of them are just so outstanding, really enjoyed them all. Thanks so much for posting! Great pics, Sandy! I especially enjoy the ones of Naolin, and Jasper. Thanks for sharing, as always. Sorry to hear you may not be spending as much time on the Range as before, but you have all your pics, and the memories… I will certainly try to plan my next visit to coincide with one of your trips. Thank Linda. I will still be on the mountain all summer next year! I hope to see you too!! Absolutely gorgeous pictures Sandy! I have to admit, I was a bit emotional with the removal of Nye and McKennie. If I was a broke college student my pony would have gotten a buddy. I would have snatched Nye up in a heartbeat were circumstances better. I fell in love with her from day one and my heart broke a little to see her removed and in BLMs online adoption. Thank you so much for all you’ve done. You’re photos are inspiring and continue to remind me why I want to visit these guys in person someday.